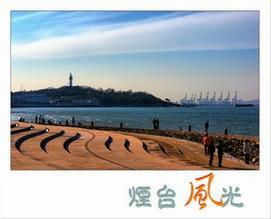 In 2004, China Central Television (CCTV) recognized Yantai as the most "Charming City of China." Yantai is located in the northeast of the Shandong Province. It is bordered by both the Yellow Sea and the Bohai Sea, and lies across from South Korea and Japan. The city includes four districts - Zhifu, Fushan, Mouping and Laishan, and Changdao County, and administers seven county-level cities - Penglai, Laiyang, Haiyang and Longkou, Laizhou, Zhaoyuan and Qixia. Of these, Zhifu is the central district. Although Yantai is not a metropolis like Beijing and Shanghai, it has its own unique charm. Evidence suggests Yantai existed as a city as long as 10,000 years ago. It was visited three times by the first emperor of the Qin Danasty, Qinshihuang (259BC-210BC). During the Ming Dynasty (1368-1644) a fire platform, called Langyantai Platform, was constructed on the northernmost city hill, as a means of defense against pirates. General Qi Jiguang of the Ming Dynasty fought against pirates using this platform, and developed Penglai Water City, a navy base which remains well-preserved to this day. Although Yantai is located in North China, monsoons regulate the climate, keeping it warm and humid. The average annual temperature is 11.8C (53.24F). Fruits and vegetables are plentiful in Yantai, and the long coastline and over 60 islands make the area ideal for any seafood connoisseur - sea-cucumbers, abalones, scallops, crabs and prawns, are all easily available. Yantai's earth is rich with resources as well - its gold reserve, in particular, has the highest output in China. Adding to the draw of Yantai's natural resources, the picturesque scenery in and around the city has earned the area acclaim by the United Nations, which lists it as one of the most inhabitable places in the world. Undulating hills rise above the area's many rivers, and are framed by beaches and neighboring islands. Yantai's local food is well-known all around China. Local cooks take advantage of area's abundant sea food, vegetables and fruits, creatively crafting tasty dishes. Yantai is also the cradle of wine production in China, housing the largest wine production base in Asia. With its high quality and more than 100-years of history, Zhangyu Red Wine from Yantai is a widely known brand in China and abroad. In 1987, the International Grape and Wine Bureau dubbed Yantai the "International Grape and Wine City." Today, with the city's rapid economic development, facilities in Yantai are improving, and transportation is becoming more and more convenient. Ships, trains, airplanes, buses and taxis have modernized daily life and attract tourists to Yantai.